handmade sports cars and commercial vehicles from 1934 to 1976. With the demise of the Austin-Healey 3000, California car dealer Kjell Qvale was looking for a new product to replace it. He entered into discussions with Donald Healey and Jensen Motors, who had built the bodies for Healey’s Austin-Healey cars, as well as the bodies for the Sunbeam Tiger and Volvo P1800. Kjell Qvale became a Jensen shareholder, gained controlling interest, and brought in Donald Healey as the chairman. The Jensen-Healey was designed in a joint venture by Donald Healey, his son Geoffery, William Towns and Jensen Motors, and handbuilt in the Jensen Motors factory in West Bromwich, England. It was hoped that Healey could help to contribute the sense of style that made the Austin-Healey a hit. The then-new 1973 cc Lotus 907 engine, a two litre, dual overhead cam, 16 valve all-alloy powerplant. Notice the 7000 RPM redline on the tachometer… this is an extremely high revving engine. The Jensen-Healey was the first car to use this engine, which later was used in the Lotus Esprit, the Elite, and the Eclat. While the type is commonplace today, this engine has a claim to be the first multi-valve engine to be used in a “mass produced” car. This setup puts out approximately 144 bhp, topping out at 119 mph and accelerating from zero to 60 mph in 8.1 seconds. These were Corvette numbers back in the early 1970s… out of a 4 cylinder engine! Jensen Motors ran a factory team to capture the SCCA D Production Championship in 1973 and 1974. Although it was a new car, the Jensen-Healey went on to become one of the few cars in SCCA History to capture a championship in its first year of racing (1973). Lee Mueller captured a second D Production championship in 1974, before a reclassification put them into other fields. In effect, they were banned for being too competitive! The Jensen-Healey, while handbuilt in the Jensen factory, sourced its mechanical and trim bits liberally from other British cars of the time. Thus, the suspension, steering gear, brakes and rear axle were adapted from the Vauxhall Firenza, while the transmission is a four speed Chrysler unit sourced from the Sunbeam Rapier. Trim and lighting components were shared with the Reliant Scimitar, Hillman Avenger, Ford Cortina, Triumph Spitfire, and Morris Marina, among others. Well, there weren’t that many made, and early models suffered from quality issues, mostly related to the still-experimental Lotus 907 engine. 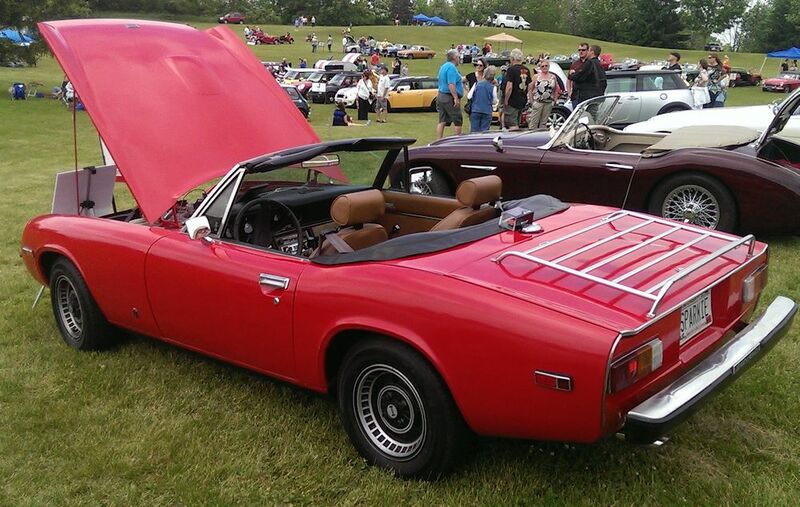 The Jensen-Healey was produced from 1972 through 1975, and the company folded shortly afterward due to labor problems. There were 10,502 Jensen-Healeys produced, and estimates are that there are approximately 700 still on the road.